Hana Song, the 19-year old ex-StarCraft pro from South Korea, is a celebrity. 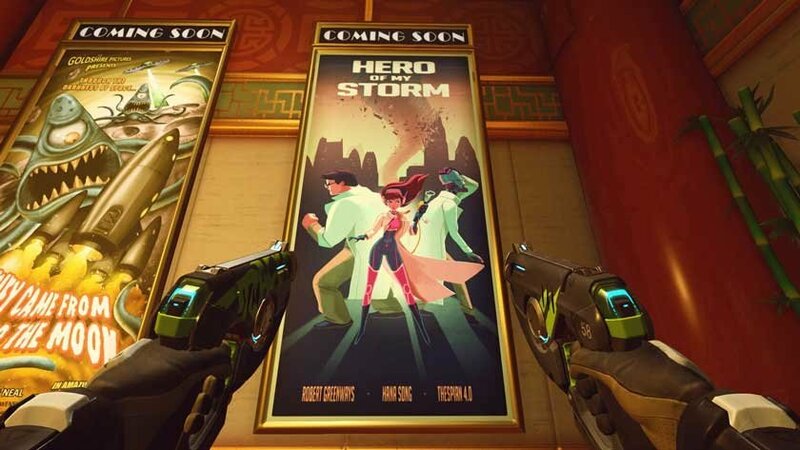 A poster of Song’s starring role in the movie Hero of My Storm gleams of her star personality in Overwatch’s version of Hollywood. She streams all of her combat operations live to a global crowd and advertisements for them are found strewn across the walls of Hanamura. On them, plastered in large text, is her stage name: D.Va. 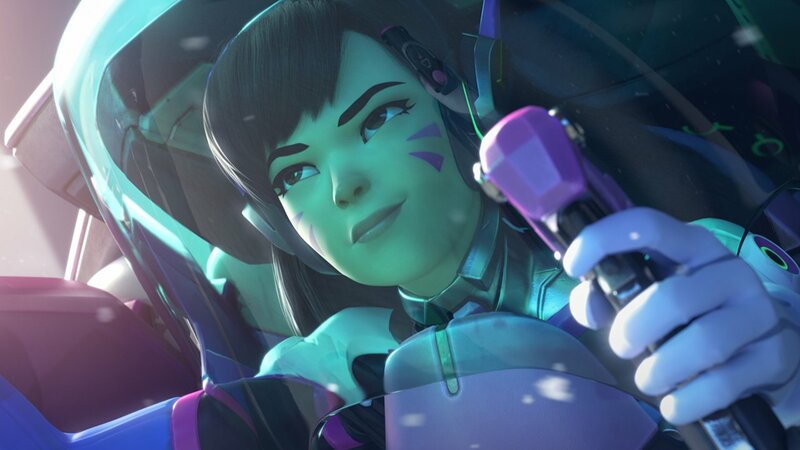 The name rings with bunny-hopping personality a contrasts the cold reality of other characters like Widowmaker, who says of her, “This is no place for children.” And with flags decorated in her honour, and a virtual production line of fan art, fiction, and cosplay for a game that boasts 25 million players, the celebrity of D.Va reaches far past Overwatch’s fourth wall. Blizzard gave her this sensationalistic design for good reason. Her design reflects South Korea’s national spirit, which is also sensationalistic. It’s evident the company delved into Korean culture to bring forth a figure with a respect and attention to detail the country deserves. Though this is hard to see at first, considering how easy it is to foxhole D.Va as a made-for-face character model—forgivable, considering her bubble-gum blowing, wink-to-the-fans attitude. But, as opposed to the West, where brazen pop stars could be seen as ditsy byproducts of commercialization, the people of South Korea take great pride in them. Westerners would be surprised to find that the South Korean government is known to earmark “1 per cent of the national budget to spending on subsidies and low-interest loans to cultural industries, launching agencies to promote and expand K-Pop exports.” The line up of girl groups in Korea show similar gun-shot gestures, winky faces, and accentuating half-leans—D.Va would fit right in standing beside superstar Seolhyun Kim of AOA on a soju advert, or participating in celebrity pop star archery games beside Lee Hyeri of Girl’s Day. The key to understanding why South Koreans are so involved in entertainment lies in the concept of what they call “Hallyu.” Hallyu literally translates to the “flow of Korea,” and the term originated in the late 90s from Beijing journalists who noticed the incredible speed of the growing popularity of Korean entertainment and culture at the time. Even further back than that, Korea’s deep sense of pride really began following the Korean War, when the country transformed from one of the poorest in the world to a developed, high-income economy in the span of a single generation. The miraculous economic expansion, commonly called the “Miracle on the Han River,” culminated in the 1988 Summer Olympics in Seoul. Koreans saw the event as a sort of coming-of-age moment for the nation, where they could display their newfound wealth, announcing their presence on the world stage. South Korea remains one of the fastest growing developed countries in the world today, and entertainment is one of their greatest exports. That’s where the role of celebrities comes in; they are the industry’s ambassadors. D.Va’s story of global stardom begins with her professional gaming career. In a clever marketing move by Blizzard, an official StarCraft II World Championship Series profile of D.Va shows that, at age 16, she “became the #1 ranked player in the world and proceeded to go undefeated for the next three years in all competitions.” Meanwhile, 20 years prior to present day Overwatch, the South Korean government developed a mechanized armoured drone unit called MEKA (Mobile Exo-force of the Korean Army) to protect their shores from recurring attacks by a colossal omnic monstrosity that rose from deep in the East China Sea. As the omnic continued to adapt, it eventually disrupted MEKA’s drone-controlled networks, and forced the military to place pilots in the mechs. Suitable candidates were found in professional gamers like Song, who possessed the necessary reflexes and instincts to operate the mechs’ advanced weapon systems, evoking an East-Asian ancestry of young teens using their skills to defend against giant monsters. 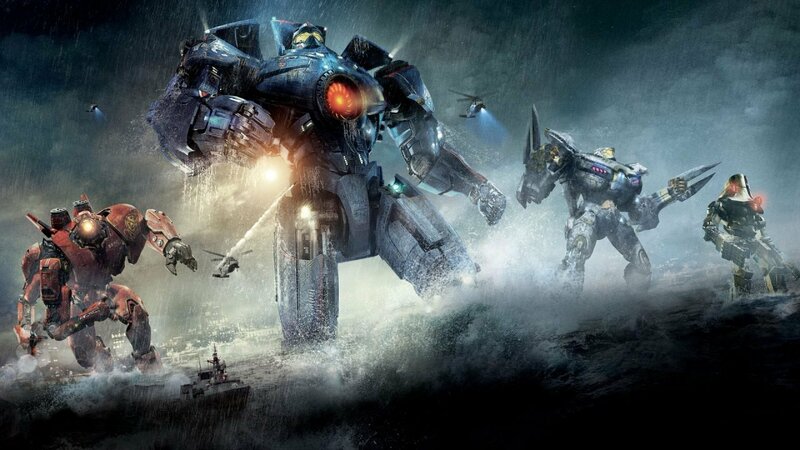 Traces can be drawn to Hideaki Anno’s Evangelion series, Bong Joon-ho’s The Host, and even Guillermo Del Toro’s interpretation in Pacific Rim. It introduces yet another national Korean tradition: conscription. South Korea currently administers about two years of compulsory military service for males between ages 18-35. D.Va’s inclusion in South Korea’s militaristic activities in Overwatch’s fictional future paints quite an inspiring picture for women’s equality. It’s this attention to culture and respect for women that has allowed the character to become the mascot for The National D.Va Association, an organization which made headlines recently after their flag appeared in a photo at the Women’s March in Seoul. The National D.Va Association “first started off as a feminist gamer group, gathered to voice our opinions about (currently ex-) President Park Geun Hyu,” a member of the group known as Nine told Polygon in an interview. The group chose D.Va as its symbol owing to an earlier incident where a 17-year-old female Overwatch player named Geguri was accused of cheating for having an 80 per cent win rate. The accusers, professional Overwatch players, could not believe she was so skilled. “So we decided to act for feminism under her emblem, so that in 2060, someone like D.Va could actually appear,” Nine said about the organization. 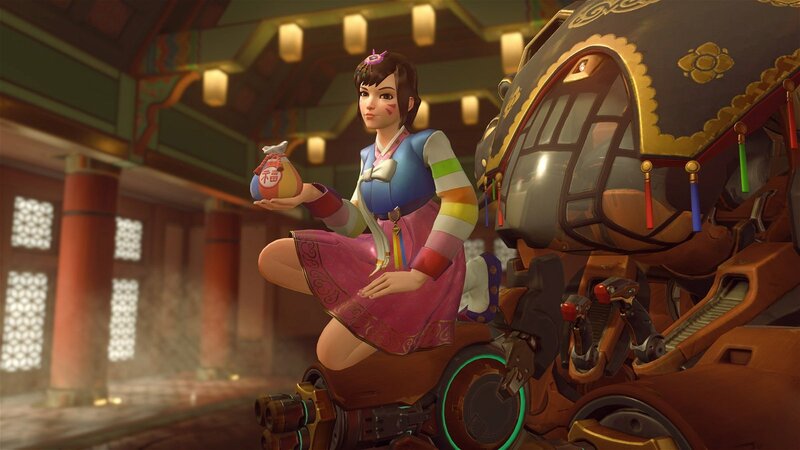 On a more colourful tone, Overwatch’s recent “Year of the Rooster” Lunar New Year’s event further celebrates Korea’s traditional culture by introducing a new skin in which D.Va dons a hanbok; a decorative Korean dress characterized by vibrant colours and simple lines. She stands in front of her mech, which is in the style of an East-Asian palanquin, and holds out a pouch of coins. The coins celebrate a New Year’s tradition in which Elders reward children who give them New Year’s blessings with envelopes or silk bags of money. As for D.Va’s default get-up, the inspiration probably takes from the current popular Korean fashion-trend of wetsuits. Subtle as the detail may be, it’s the cherry on top of Blizzard’s sensitivity to both the national and stylistic elements of Korean culture. They have created a character Korea can be proud of. And with Koreans as the top Overwatch players in the world, the only irony remaining is that D.Va’s top player is American. But here’s hoping that this deep-dive into D.Va’s relationship with her home country clarifies just a bit as to why she doesn’t look like the stereotypical dorito-munching, mountain-dew guzzling gremlin gamer traipsing around Tumblr-town in all her glory. Is Spider-Man coming to the MCU?